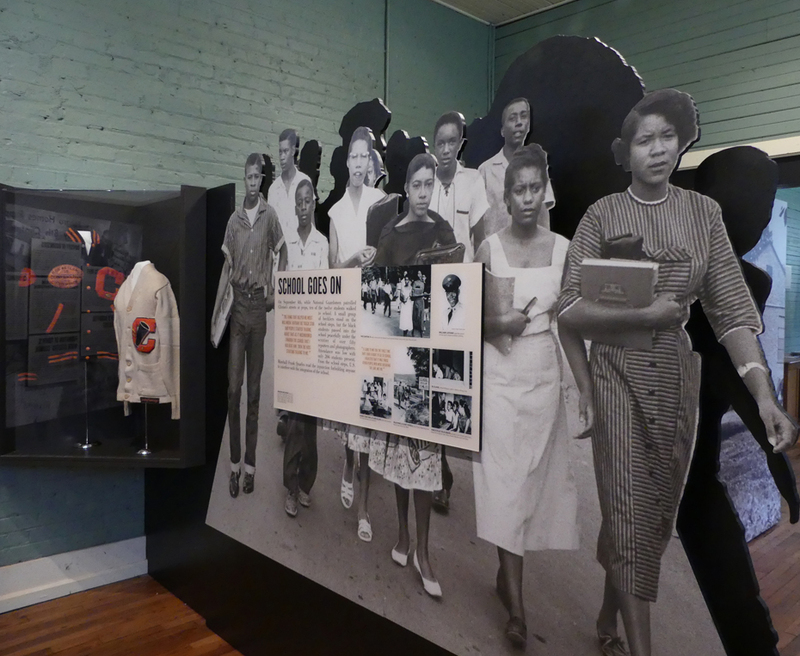 A visit to The Green McAdoo Cultural Center in Clinton, Tennessee is a lesson in a painful part of American history. One we should all visit. It's a simple place where we can all imagine ourselves at the center of a storm of hatred. Picture yourself a teen boy or girl in August of 1956. You want to go to high school. Seems normal. Should be no problem. No problem that is unless you happen to be a Black graduate of Green McAdoo Elementary School. 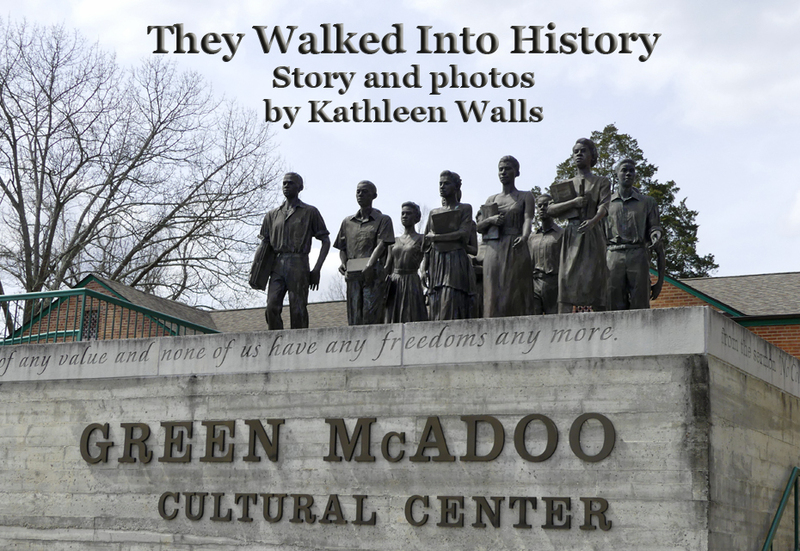 The centerpiece of the Green McAdoo Cultural Center is a sculpture in front depicting 12 brave Black students as they walked into history as the first African American students to integrate a public high school in the south. They became known as the Clinton 12. Step into the center that was once the school to learn more about the event. This small room was the entire school classroom for K through 8th grade. When the students graduated here, they had to be bused to Fulton high school 17 miles away, a 45 minute drive down a small two lane road even though there was a public high school here in Clinton. After Brown vs Board decision, Black parents sued and won in 1956. The resulting months are portrayed at the Green McAdoo Center with life-sized cutout figures and often disturbing documentation. 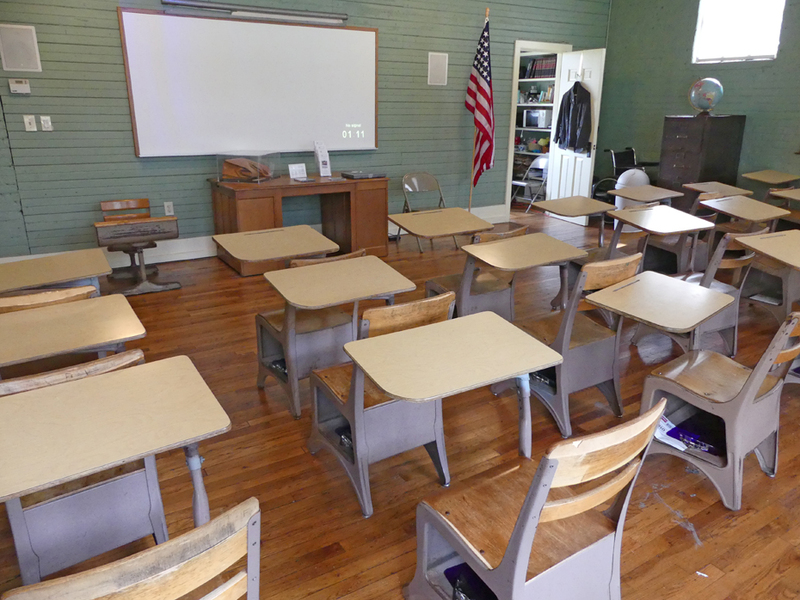 This was the Green McAdoo classroom for first through eighth grade. The twelve students who were in high school that year were escorted to the Clinton High School. The first three days, were relatively peaceful; Clinton's citizens were law-abiding people. The local Baptist minister, Rev. Paul Turner, accompanied the young Black students as they walked down from Foley Hill. So far it sounded like a Garden of Eden scenario but into each garden a serpent must come. This serpent was a white supremacist named John Kasper. Outsiders brought violence into the peaceful community of Clinton, Tennessee. Kasper came to Clinton from Washington and began to stir up hatred. Kasper was a leader of a group called the White Citizens' Council organized to stop integration. 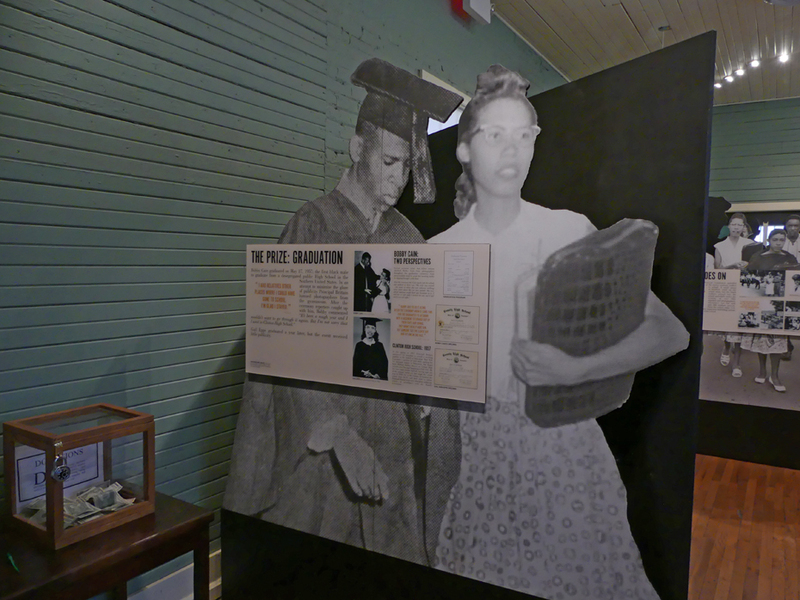 He was aided by Asa Carter, a Mississippi segregationist, aided Kasper. Rev. Turner was beaten by a group of white protestors. School principal, David Brittain, received death threats. Explosives were detonated in the Black neighborhood. 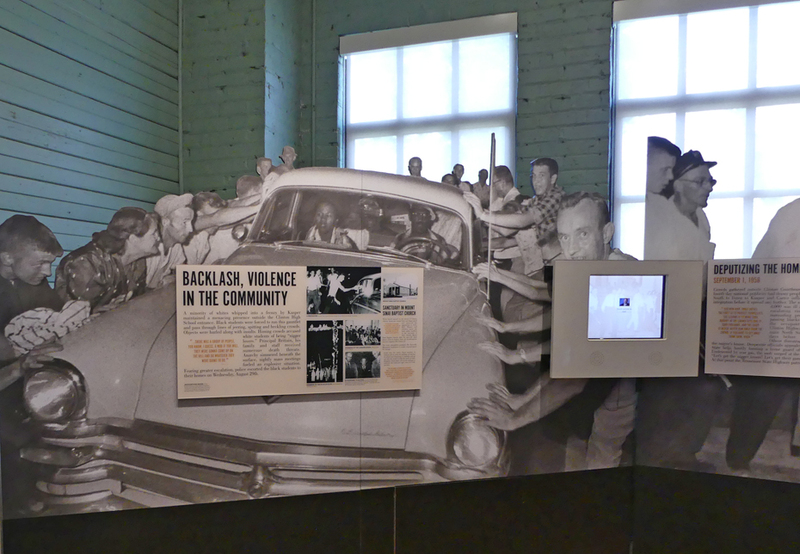 One of the most moving exhibits is of a car with an African American family inside being harassed by a mob of angry whites trying to overturn the car. The expressions of the family inside the car show stark terror. The sheriff formed a home guard to try and keep order and when that failed, the National Guard was called in to maintain peace. Kasper was arrested and tried for inciting a riot but acquitted. The Clinton 12 persevered. The next year, the high school was destroyed by a bomb. That's another disturbing exhibit. However, the students, black and white, went to Oak Ridge until Clinton High School was rebuilt. Then both races returned to continue their education in the new integrated Clinton High School. Board Member Larry Gann was in charge at the Museum the day I visited. He was a child at the time of the integration, but recalled that his father, who was a merchant in Clinton, made it clear everyone was treated the same when they entered his store. That reflected the attitude of the majority of the white citizens of Clinton. Larry stated, "Kasper and Carter were outsiders who decided to come to Clinton and see what they could stir up." Bobby Cain and Gail Ann Epps Upton, first Clinton 12 graduates. The Clinton 12 were Maurice Soles, Anna Therese Caswell, Alfred Williams, JoAnn Crozier, Allen Boyce, Regina Turner Smith, Gail Ann Epps Upton, Ronald Gordon Hayden, Robert Thacker, Bobby Cain, Minnie Ann Dickey Jones, William R. Latham, and Alvah McSwain. Bobby Cain became the first African American male to graduate from an integrated state school in 1957. Gail Ann Epps Upton graduated the following year. Their bravery in standing up to injustice is an inspiration to all.